Ciena and the industry gathered in Denver, Colorado, for the annual Super Computing industry event. SC, as it’s called, is a conference and exhibition co-sponsored by the Institute of Electrical and Electronic Engineers (IEEE) and The Association of Computing Machinery (ACM) where Ciena continues our long-standing sponsorship and participation. SC17 included a major technical conference attended by over 13,000 computing professionals from 71 countries and a 150,000-sq. ft. exhibit floor with 338 exhibitors. It is, in my opinion, the very best opportunity to experience the intersection of High Performance Computing with High Performance Networking, and of course, it represents an exciting opportunity for Ciena. We were involved in 3 significant ways. Firstly, we staged a cracker-jack exhibit stand to showcase our leading solutions and emerging technologies. 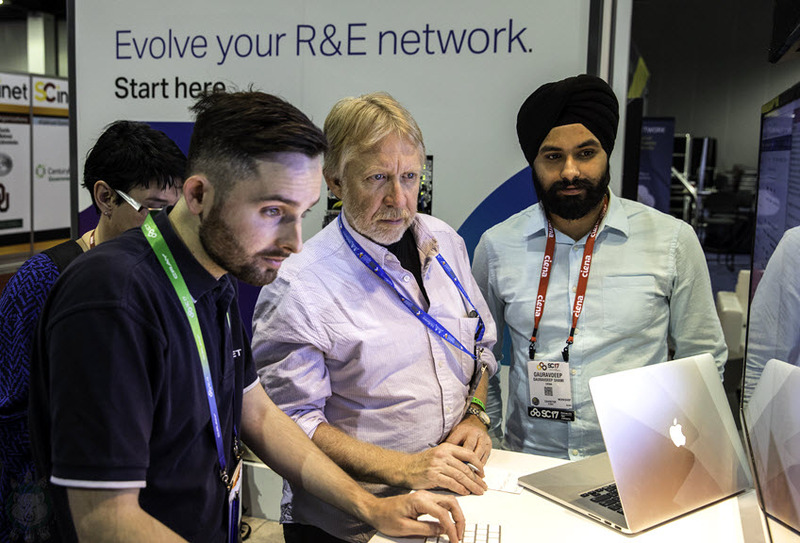 As part of our contribution to the SC17 network infrastructure, this year we brought our Ciena Waveserver Ai and 6500 platforms powered with WaveLogic Ai coherent optics to deliver unprecedented capacity with the industry’s first single-wavelength 400Gbps connections, and the début appearance of Ciena’s recently enhanced 8700 Packetwave Platform. More on this later. SC17 is an event where customers and visitors want to see what’s real and what Ciena can do. The emphasis must be on live, operational and fully connected activities. Our demonstrations this year did just that. Another highlight from the demonstration, Liquid Spectrum: Making Software-defined Autonomous Networks a Reality, displayed how intelligent automation enables operators to transform network margin into capacity and deploy end-to-end services across a complex infrastructure quickly and simply, to gain service agility and operational efficiency. We also touched on Blue Planet Multi-Domain Service Orchestration and how operators can gain insights into network element resource deployment, Blue Planet Distributed Network Function Virtualization (D-NFV) network automation solutions, and Ciena’s Emulation Cloud environment for customer application development and testing. SC is an event where customers and visitors want to see what’s real and what Ciena can do. The emphasis must be on live, operational and fully connected activities. Our demonstrations this year did just that, and visitors to our booth were thrilled with what we showed them. Ciena had an outstanding team who brought these demonstrations to life (a big shout out to Marc Doucette, Deyan Dichev, Francis Gagnon, Steve Glenn, James Herberich Jim Parker, Gauravdeep Shami, Katie Taylor, Lance Williford and Gord Wice). It takes High Quality People to activate High Performance Networks and this is the team to do it. Also present in Ciena’s booth were students and researchers from our CTO Group’s External Research Program with presentations by the University of Amsterdam (R. Koning) on advances in the Secure Autonomous Response Network Cyber defense project. and GÉANT, the trans-European Research Network (J. Sobieski), showing dynamic allocation of high performance user defined virtual network environments over Ciena’s live International Testbed. These guests and their demonstrations brought special attention and energy to our exhibit. Machine Learning in Intelligent Networks was a hot topic on the show floor. I became rather fond of saying, “our intelligent machines are networks.” Ciena’s CTO Group provided an experimental application of network machine learning algorithms that anticipated traffic fluctuations and, through use of Blue Planet Analytics and SDN orchestration, tuned the network autonomically, spontaneously, and without operator intervention. This garnered the attention and nodding approval of visitors from the National Science Foundation NSF Tomorrow's Internet Project Office (TIPOFF), and Caltech University. A third and vital SC17 activity was our Platinum level sponsorship of SCinet, the International high-performance research network that gets established so university and scientific participants can access remote high-performance computing resources and showcase their projects in a live environment. SCinet also provided a huge variety of services vital for an event like SC, including conference wide WiFi, booth connectivity and specialized custom-provisioned network services. Just in case you might be thinking this is typical trade show fair, the network consisted of 280 wireless access points, 2,570 fibre cross connections, 60 miles of hand-laid show floor fibre by 180 volunteers who operate the network for the 4 days of the show. The network consisted of 280 wireless access points, 2,570 fibre cross connections, 60 miles of hand-laid show floor fibre. Extending well beyond Denver, the WAN connections to remote home institutions provided bandwidth of 3.63 Tbps. The net value of equipment to accomplish this comes in at about $66 million dollars! It takes a year to plan, a month to build, operates for five days and 48 hours to take down. Volunteers come from all over the world to contribute their skills and know-how. Ciena’s SCinet involvement was significant, providing our 6500 Packet-Optical, 8700 Packetwave, and Waveserver Ai platforms as our contribution this incredible multi-vendor, multi-layer, multi-faceted infrastructure. In lock step with the underlying innovation theme at the show, both the 6500 and Waveserver Ai products used the latest in coherent technology innovation to transport SCinet traffic at unprecedented wavelength speeds of 400Gbps. But product is not enough. A network of this size and performance level needs more than just our very latest technologies. Success is only realized when backed up by our human expertise and top-flight services. 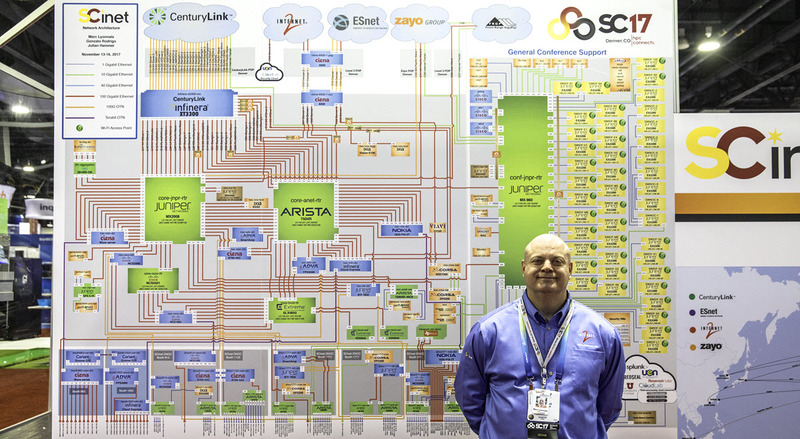 The SCinet Architecture design team was led by Ciena’s Marc Lyonnais (CTO Group and pictured above) and our WAN and Switching contribution was led by Scott Kohlert (Optical Transport R&D). I found SC17 exhilarating, and I’m already thinking of new ideas, demos and High Performance Networking applications for next year. SC18 will be held in Dallas Texas November 11-16. Very nice write up Rod! Ciena's Renee Reinke highlights three key trends in research enabled by supercomputing and the networks that connect them that will change our daily lives in the very near future.